Thanks to hurricane Irene, we lost power for three days. Not nearly as bad as others have experienced, I know, but bad enough. I never really know what to do with myself when the power goes out. Clean a closet? Uh…no. Organize stuff? Right. Plant myself on the sofa with some yarn and knitting needles? Sweet. I purchased this gorgeous yarn called Polaris, by Rozetti, at WEBS. It is a wool/acrylic blend with itty bitty sequins throughout. The color is called Cloud Cover, which appears gray or violet depending on the light. Since I’ll be attending two weddings in the month of October, I thought it would be a great compliment to my deep plum dress. 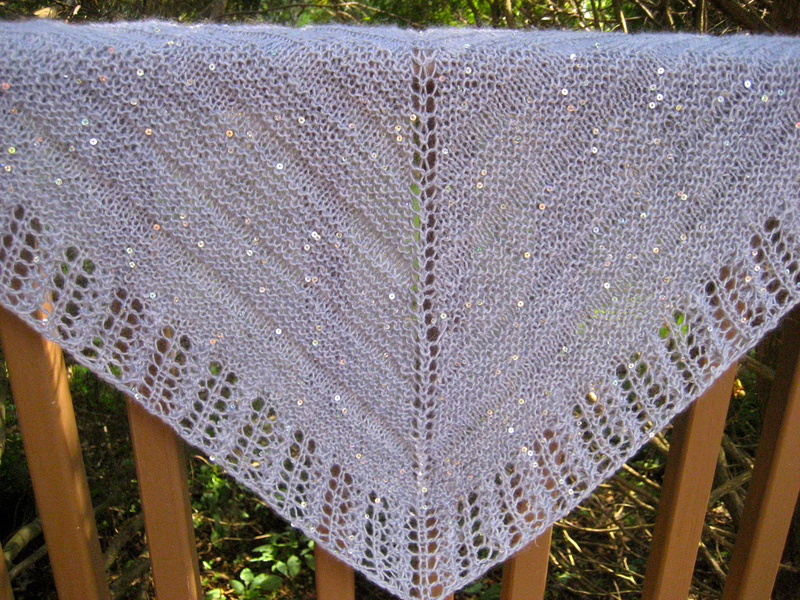 The pattern is “Porch Swing Shawl” and can be purchased on Ravelry. It’s a relatively easy pattern to follow and, with great yarn, you get a lot of “bang for your buck”! 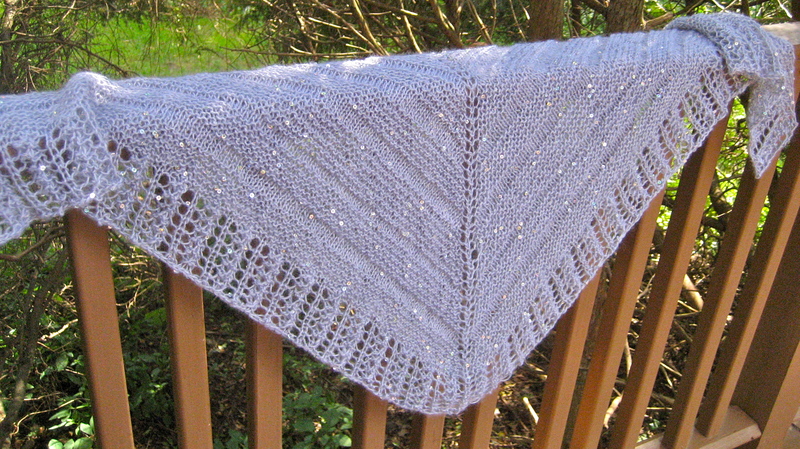 It took me four days to complete this shawl. I worked on it during daylight hours, and I actually knitted in the dark by the light of an oil lamp. That unfamiliar sound you all heard a few days ago was me screeching with delight when power was restored. Pioneer woman, I am not. If I couldn’t wear a shawl with sequins or other sparkly embellishment, I’d be riding the Trail of Tears. Your shawl is beautiful… You will look gorgeous!!! new shawl…new dress… new body!!!! If we weren’t going to the same wedding I’d ask to borrow it…..love it! We are gonna have such a good time…….I can’t wait!!! BTW, I can see a name-spelling correction is necessary…it’s Bethy with a “y”…sorry ’bout that!